WHEN AMBER SEYLER began shooting A Dozen More Turns, she intended to make a film about snow. A graduate student at Montana State University's Science and Natural History Filmmaking School, Seyler was interested in the science of avalanches, so she began filming avalanche classes and interviewing snowpack experts. 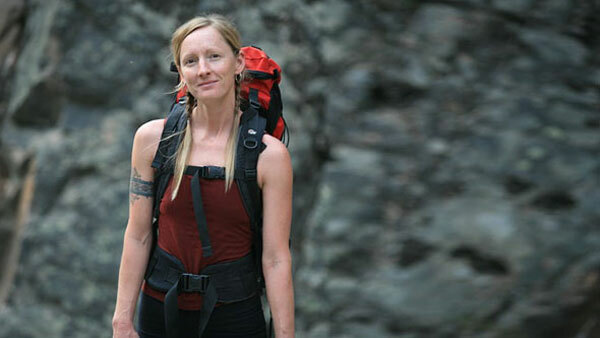 Then Amber met a survivor of a deadly avalanche on Montana's Mount Nemesis. Layers of snow alone could not explain what had happened on Mount Nemesis, and Amber knew she'd found a story that had to be told. The result is a haunting film that challenges traditional assumptions about backcountry safety. Amber, How did you become interested in making films? All of my life, I had wanted to be a filmmaker. I loved animal films, fiction, just the whole art of telling a story. I grew up in South Dakota in a family where people just didn't get to do that kind of thing. My relatives were farmers, blue collar workers, and no one had ever really followed that sort of artistic dream. It just was sort of off the radar for us. And so, I always wanted to do that but always figured that was something other people got to do. When I first went to school, I was studying English and International Relations, and I wasn't really sure what I was going to do with it, so finally I decided, I'm spending a lot of money on school getting a degree I don't want, so I'm going to leave until I know what I really do want. I took about six years off in the middle of my undergrad and decided that it was just really worth following my dream. It sounds totally cheesy—the whole notion of some apple-cheeked, naive person standing up and going, I'm going to follow my dream was kind of silly to me, but at the same time, I knew I wouldn't be happy unless I tried. What drew you to Montana State's film school? When I came across this graduate program at Montana State University, at the time it was the only program of its kind in the world. I stumbled across it on the internet—I was just doing some searches—and it seemed like it was made for me. They required that you have a science background to get in to this program, and the focus seemed exactly on what I wanted: science films, wildlife films. So I decided to apply, I decided, you know, go for it, if I get in, great, if not, then I'll see what my other options are. You're also a rock and ice climber, and a mountaineer. Where did you learn to climb? I learned to climb in Seattle. Actually, I came to it pretty late—I started climbing the summer before I moved to Bozeman, just became obsessed, and I was 31 at the time, kind of late to take up climbing, but I seemed to sort of have a knack for it. So, I kept doing it, kept climbing, and then began ice climbing...this is a great place for it, world-class ice climbing, so I decided to learn that too, and decided I loved that too. Soon after you moved to Montana to go to school, you became a backcountry skier. Can you tell us about your first backcountry skiing experience? I was lucky...I'd never even skied until I moved to Montana—never once. So I skied for about a year, and then, I was lucky that I had a really good friend who was obsessed with skiing. You know, throw a rock in Bozeman and you're going to hit ten people who are obsessed with skiing, but he's also incredibly generous with his time, with gear, he's very patient. So he just happened to have gear that was a size I could use, so I borrowed it. There's a ski resort here called Bridger Bowl, which is a great place—I love skiing there—there's a lot of really great backcountry skiing just around the boundaries. My friend didn't want to overwhelm me for my first time, so we just decided to stay on the periphery of Bridger, so we went up an area called Slushmans, and it was great. Skinning up was kind of overwhelming. The skins weren't that good, I kept slipping, my legs hurt, but I still was having a great time—it was like rock climbing for me. I loved it because it was hard and challenging and I still wasn't that great a skier, so I sort of spazzed my way down the hill just laughing and having a great time. So that was it—after that, I knew I loved it, so every chance I got I would bug that friend, Hugh, or someone else to take me up. Really, shortly after that, I decided to do this avalanche film. Let's talk about the genesis of A Dozen More Turns. Was it specifically backcountry skiing that got you interested in avalanches? That, but also, I was receiving the local avalanche report on a daily basis. Reading the reports, and hearing talk about the snowpack—the guys that run the Gallatin National Forest Avalanche Center are amazing. Their avalanche reports were always incredibly informative, but also incredibly humorous and engaging. I had met one of them, Doug Chabot, who heads the avalanche center here, and one of the things you need to have for a great story is a great character, and I knew Doug would be a great character. He's very engaging, very charismatic, he really knows what he's talking about, and I thought, well, if I have that component—I have a great character—and I'm also really interested in the topic—I want to know more—then maybe this would be a good project for me. So I talked to Doug about it to see if the avalanche center would even be interested, because I would be making it as a tool to have in their classes, and if they had no need for it, then there was no purpose to make the film. And Doug seemed interested—he got excited about the idea, and it just sort of went from there. Initially your goal was to make an educational project? Absolutely. Originally, this film was going to be very 'sciency'. It was going to be all about snowpack and digging pits and different layers. There's a brilliant scientist here at MSU named Ed Adams who's in the film briefly, he does amazing research on the physical aspect of snow, and that's what I was interested in filming. I was going to have a small portion of the film be about survivors—actual avalanches and survivors, so I asked Doug do you know any avalanche survivors that I could interview for the film, and the first person he thought of was Sam Kavanagh because Sam had just emailed him and said I really want to help with avalanche education, it's really important to me, I was lucky enough to survive this avalanche and I want to do something. So Doug said let's see if Sam would be interested. And when I went into the interview with Sam, I expected it to be maybe a thirty minute interview, get to the point, and then cut that into maybe a minute or two of the film, but as soon as I sat down with Sam and started hearing his story, I knew that that had to be the story. I'm going to give a quick summary of the film for those who haven't seen it. 'A Dozen More Turns' documents an avalanche on Mount Nemesis, in Montana's Centennial Mountains, involving Sam Kavanagh, Blake Morstad, and three other friends who were backcountry skiing on New Year's 2005. Because of high avalanche danger, they had talked about and identified safe areas to ski, but over the course of the day they gradually pushed closer and closer to an obvious danger zone which they had specifically decided to avoid. Backcountry skiers tend to think of the avalanche problem as being essentially a challenge of assessment—identifying hazardous conditions. But here we see a group of skiers with a very high level of technical expertise explicitly aware of the hazard, and they still got into trouble. Did that make sense to you? Absolutely, because that's the main problem with a lot of slides. You have people who go up, and they've taken a class, they know something about snowpack, and more often than not they know what the avalanche report for that day is, they've gone online or called the hotline. They set out with the best intentions, they're going to stay in safe terrain, assess the terrain, but what happens is—people who are doing this love skiing. They love being out there. You get to this area where you're looking at this field of powder and you've skinned all the way up there or you've sledded all the way up there, and you're just so excited to be there, and the snow looks so good. And you know in the back of your head that the avalanche danger is not good...Sam says it perfectly in the film: it's the stoke of the day. You're stoked to be there and you want to ski it, you've gone all the way up there. And you can think of a million reasons to justify why you should ski it instead of looking at the one reason why you shouldn't, which is that it's too dangerous. So people are able to talk themselves into it just because...it's the human factor. They're stoked, they're excited to be there. They want to ski. So it didn't surprise me, because so many people do that, and so many times they get lucky, and they don't get caught in a slide, and that's why this film needed to be made. Because, okay, so you know something about snowpack, but when you get up there you still have a huge decision to make, and it's not just based on what you know about snow. Amber, do you see a change taking place in avalanche education in this country from trying to understand snow mechanics to trying to understand what you and Doug Chabot call the 'Human Factor'? I hope that they're talking about it more, because for so long the push was for people to know about snowpack, to be able to evaluate it, and now maybe it's evolving—it's coming full-circle that that's not the only component. The circumstances of the Mount Nemesis avalanche are certainly laced with irony. As a filmmaker you resisted the urge to comment or editorialize about that. Your film is very neutral in its telling of these events. Was that a deliberate choice, and if it was, was it something you struggled with? I wouldn't necessarily say I struggled with it. It was absolutely a deliberate choice. I wanted to tell the story and give all the facts...people are going to take away from this story what they need to know. Here's a group of guys that love skiing, who know a lot about snowpack, and they got themselves into big trouble with pretty devastating consequences. The last thing I needed to do was editorialize on it because I think the story speaks for itself. Before I was even a backcountry skier, I knew this story. There was a lot of editorializing going on in this area, and...people can watch the film and take away what mistakes were made, and then incorporate that into their own decision making. To be honest, I sat Sam and his wife down along with Addie (Blake Morstad's widow) and had them watch the film before anyone else saw it, because if they hadn't been okay with what was in it, I wouldn't have shown it. I knew it was an important story to tell and people could learn from it, but a lot of people have gone through a lot of pain because of this incident, and I am not going to be the one to cause them more pain. How has the process of making A Dozen More Turns changed how you approach your own adventures in the backcountry? I have to admit when I first started backcountry skiing, I shifted the responsibility of it...because I was out with people who knew a lot, and I didn't know as much as I should have known. So I just assumed, well, I'm going out with them, they know a lot, that's good enough. And as soon as I stared making this film, I realized that's the worst possible attitude you can take. You have to be responsible for your own safety. You never know what's going to happen. You never know when the person you're with that is the authority is going to get incapacitated in some way, and then you're responsible. As soon as I started taking on this project, I went to all the classes, and I didn't just film them, I actually took all the classes. Now when I go out in the backcountry, every early season, every fall my friends and I do beacon practice so we know we're up on our skills. When we go up there we dig pits and we listen and we look and don't take chances. I love skiing, but I'll tell you what—I want to love it for a really long time, and I'm not about to take any chances and die doing it. The more expertise and knowledge you get about avalanches, the more humble and conservative you should get, rather than the opposite. Exactly. And that is the case for some people, but some people get more cavalier, and that's just because I think they forget about the human factor. They forget that everyone's mortal. If people want to see A Dozen More Turns, how can they get a copy? There are a few different ways. You can go to backpackinglight.com and buy a copy—and we kept it really cheap because we don't want cost to be a factor in anyone being able to see this film, so you can get it for I think $5.50 and that includes shipping. For that amount of money, it shows up on your door, and you can watch it, show it to all your friends, make sure they hear the message in it. You can also download it for free, and there are a few different websites but I think the best resolution is lifeonterra.com and search for the name of the film — A Dozen More Turns — and that's completely free. Amber, thank you very much for your time today! Thank you — thanks for helping spread the word.